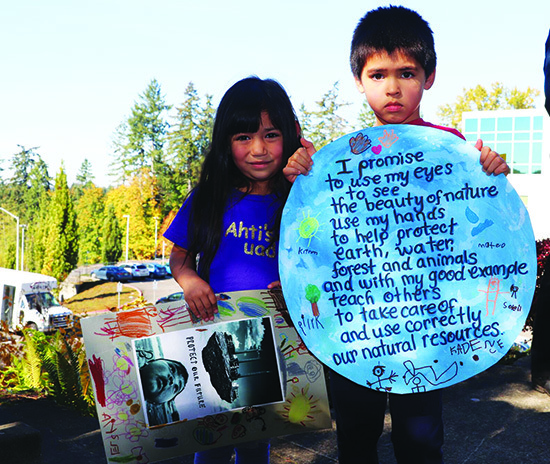 On a sunny autumn afternoon, a gathering was held outside of the Western States Petroleum Association building in Lacey, Washington on October 17. Many participants arrived wearing cedar hats and headbands and carrying traditional hand drums, as tribal members journeyed from around the state to show support of Initiative Measure No. 1631, an effort to charge pollution fees to large greenhouse gas emitters and conserve our natural resources for generations to come. As more and more participants arrived, they began to make signs to wave at local commuters who were taking a shortcut through an I-5 overpass. 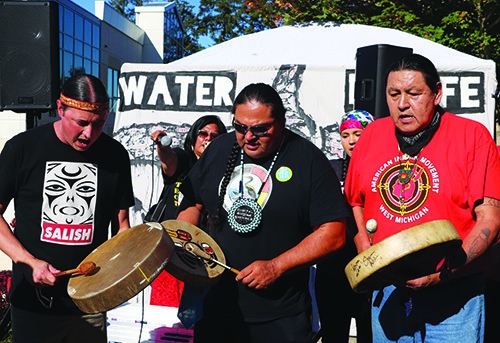 A number of small drum circles began to form and prayers were shared while they waited in anticipation for the I-1631 rally guest speakers to take the floor, including former Standing Rock Chairman, Dave Archambault and Quinault Indian Nation President, Fawn Sharp. As this year’s General Election date of November 6 draws nearer, it’s important to understand what I-1631 is and why it’s important for Northwest tribes. The initiative is a climate policy that imposes a fee on organizations that burn or sell fossil fuels, that includes motor vehicle fuel, natural gas and electricity. The measure is expected to generate over two-billion dollars within five fiscal years, beginning on January 1, 2020, and is set at fifteen dollars per metric ton of carbon content, or the carbon dioxide equivalent released from burning fossil fuels. This will increase by two dollars each year until 2035, putting the state on target to reach its 2035 and 2050 greenhouse gas reduction goals. The monies generated from the carbon fee are prioritized as follows: 70% of carbon fees will go toward a new clean-energy infrastructure for Washington, utilizing clean, renewable energy, providing public transportation that uses cleaner fuels as well efficiency upgrades to homes and businesses to help save money on utilities; 25% of funds from the measure will go toward clean water and healthy forests, ensuring our forests are well taken care of and can protect the air quality, clean-up polluted lakes and rivers, increase the amount of drinking water and ensure cleaner water for salmon; and the remaining 5% will be invested into the local communities, preparing for any future problems that may arise due to climate change. 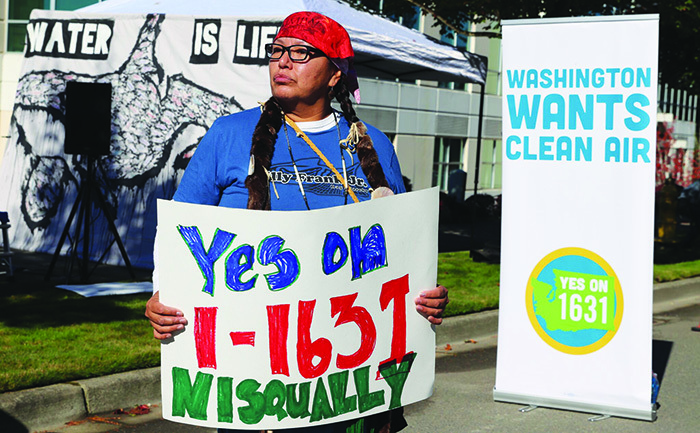 “I-1631 is a specific climate policy tribes’ gathered over the last year and a half,” says Fawn. “Quinault has been working on this initiative for well over two years and we’ve been working on climate policy for about twelve years. It was very clear to us that we’re not going to achieve climate policy in Olympia, it’s not going to happen in Washington D.C., but we were also confident that the average citizen understands the role of tribes as leaders. As the rally continued, tribal and community leaders from Tulalip, Quinault, Puyallup, Nisqually, Squaxin and several other sovereign nations shared their traditional songs as well as words of encouragement that got the crowd of over one-hundred I-1631 supporters hyped. Young Tulalip and Tsleil-Waututh Indigenous Activist, Cedar George-Parker, spoke to the youth about the importance of their voice and Earth-Feather Sovereign talked about MMIW (Missing & Murdered Indigenous Women), continuing to bring much needed awareness to the epidemic that is claiming the lives of our Native women. Dave Archambault journeyed from the Standing Rock Sioux Tribe to show his support of the initiative. I-1631 does in fact have a provision for the tribes of Washington state that requires any state agency to consult with tribes on any decisions that could directly affect the tribes, their land or their usual and accustomed fishing grounds. Projects that are funded or begin on tribal land without prior consultation will be forced to end upon request of the tribe. Keeping the tribe’s sovereignty at heart was the First American Project comprised of several tribal leaders and El Centro de la Raza, a Latino based organization that promotes unity amongst all races. 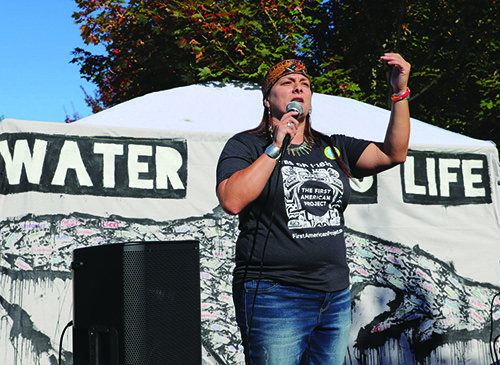 Tulalip tribal member and First American Project Board Member, Theresa Sheldon, took up emcee duties during the rally. 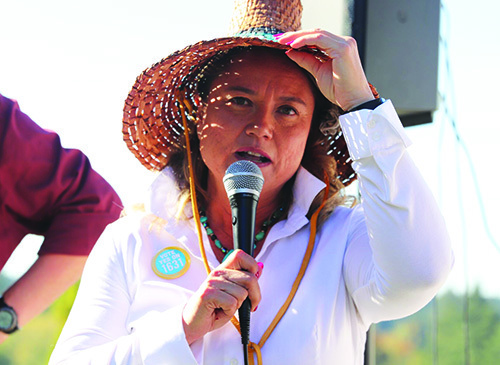 She is also the project’s Campaign Chairwomen and has been tasked with informing and educating Native Peoples on why the initiative is important. “It’s important for us because we’re the first ones who feel it,” Theresa states. “Native Peoples are like the canary birds in the coalmines, we’re the first ones to show signs of it not being safe. We’re already seeing that; we’re seeing that in gathering our cedar, gathering our huckleberries, we’re seeing the change in the seasons happen and the change in our plants. Sea level rise is already impacting our nations, look at Taholah, Queets and Hoh who have to relocate. They’re the first ones on the ocean so it’s already impacting them. Tulalip Tribes just did our climate change flood levels and in fifty years we’re looking at a lot of different areas of our reservation that potentially could be under water. That’s scary to think about, that will be during my lifetime so I’ll probably see that. Studies show that climate change is real and is currently happening at an alarming rate. If we continue to emit pollution into the environment, scientists predict that in a hundred years the world will frequently experience deadly, extreme heatwaves for days at a time. And if you think about it, one-hundred years isn’t that far away and the heatwaves are going to be something your great-great-grandchildren will have to live through. As Theresa pointed out, tribal lifeways are already being threatened by climate change, namely the Quinault Indian Nation’s villages of Taholah and Queets. If voters pass I-1631, the initiative will create over 40,000 jobs in the clean energy field, developing and maintaining renewable energy resources such as wind turbines. A number of big name supporters including Bill Gates and Pearl Jam recently expressed that they are in favor of the measure. And organizations such as Microsoft, Expedia, Union of Concerned Scientists and the American Lung Association are funding the initiative. On the other side of the coin, Western States Petroleum has dug deep into their pockets and raised over twenty-five million dollars to run a slew of misleading TV ads against I-1631 claiming that the fee is ‘unfair’ to big oil. The opposition also wants you to believe that a large amount of companies are exempt from the fee, which is true to a degree if they are referring to coal burning factories or power plants that have been legally bound to close no later than 2025. A real concern for undecided voters is that the cost of gasoline, electricity and natural gas is expected to rise as a result of the companies’ obligation to pay the carbon fee. However, funds raised from the fee will actually help Washingtonians transition into more of a clean energy lifestyle by utilizing renewable energy resources such as solar and wind power, so we’re not dependent on companies who are harming the environment. 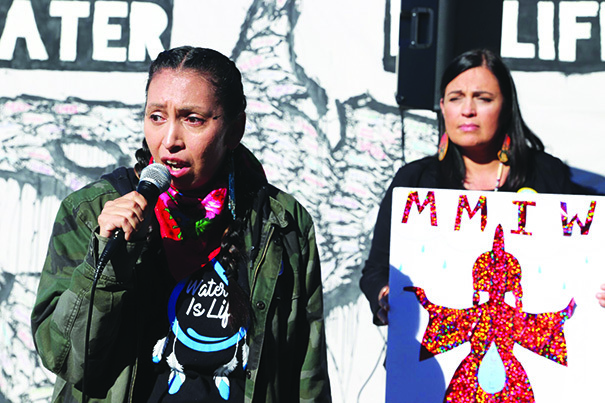 “The power of our tribal communities is so remarkable and I firmly believe that when we come together, no matter what the issue, we’re unstoppable,” expresses Fawn. “When you look at this last year, we were victorious on the culverts case, we were victorious on eleven different treaty conflicts with the state of Washington. At any time, anyone or anything tries to attack us and we come together, we’re quite successful.